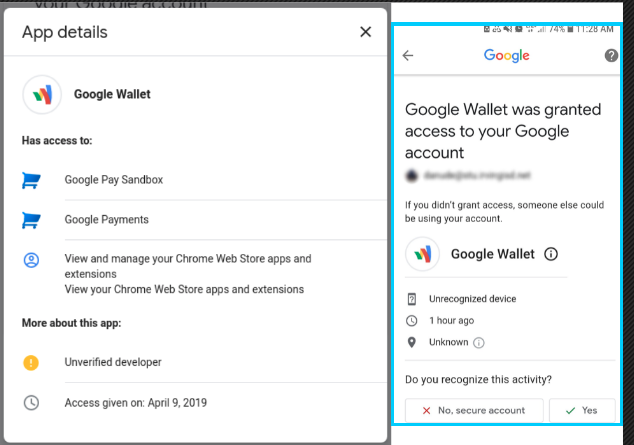 In a strange incident which has come to light recently, a fake Google Wallet app was used to give access to Google accounts. This could be potentially very harmful as it may result in privacy infringement or even having the biggest transfer of funds from your account end up in someone else’s account. Although Google Wallet is now a thing of the past and declining rapidly in usage and popularity, still such scams can result in big losses amongst any remaining consumers who still use Google Pay. These scammers generally look out for such “dying stars” to make a final profit before they are completely gone. Google Pay was a result of a merger between Android Pay and Google Wallet. Several users have reported this mysterious email that Google Wallet was given access to their Google account. An unrecognized developer is using a non-existent app to get access to people’s Google accounts. We seriously recommend checking the apps which have access to your Google account here. Revoke access of any application you find suspicious or you think is no longer required to have access to your account. We also encourage you to check your Google activity here. Google activity shows you if there were any suspicious activities like accessing your Google account from an unknown IP address/system or any unauthorized payments. Although any payment will require the user CVV number to be entered, it’s very important to take this seriously and keep vigil about all activities in your Google account, especially considering the grand scheme being displayed by the scammers this time by using a fake Google Wallet app. Thankfully Google is already on its toes and has confirmed that they are working on the issue.